Remove rear combination lamp. Refer to EXL-126, "Removal and Installation". 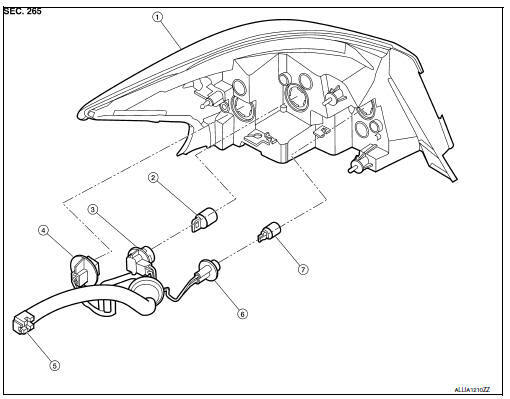 Rotate rear turn signal lamp bulb socket counterclockwise to remove from rear combination lamp. Remove the rear turn signal lamp bulb from bulb socket. Rotate back-up lamp bulb socket counterclockwise to remove from rear combination lamp. Disconnect the harness connector from the LED lamp. After installing, be sure to install the bulb sockets securely to ensure watertightness.